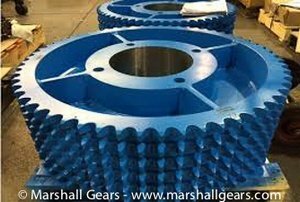 We at Marshall Gears are the industry leaders in manufacturing of Large sized Industrial sprocket gears. Sprocket gears are one of the many types of gears that are used for Mining, Conveyor, Dryers, Kilns and other similar applications. We also have sprockets that have been exclusively designed as per customer needs with a special noise reduction quality. We offer one of the most economical and reliable sprocket gears used for long term applications and items. Sprocket gears work on the mechanism wherein sprockets are connected on the engine with the help of a supporting metal chain. 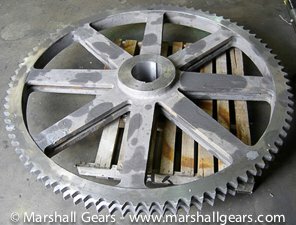 When the engine is in rotation because of the force of the machine, the larger sprocket also works. The larger sprocket is located and attached to the chain. 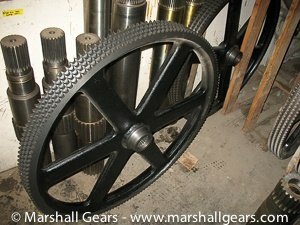 This process of working of a sprocket gear can further be explained as the one end of the chain which is a small sprocket attached on the engine starts rotating due to the force exerted by the engine. On the other end of the chain, the larger sprocket which is attached to the rear axle gives both forward as well as reverse momentum force. 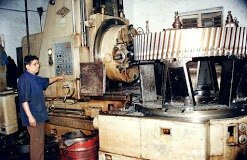 Max Dia : 3600 mm Face width: 1250 mm Up to : 3 inch Pitch.